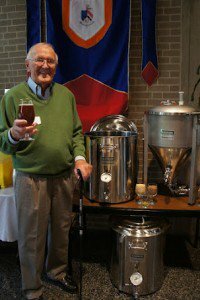 Everyone knows brewing beer is fun. But brewing beer with the purpose of supporting a non-profit service community is even more fun. And when that community enthusiastically is involved and it generates excitement, the project kind of takes off on its own. 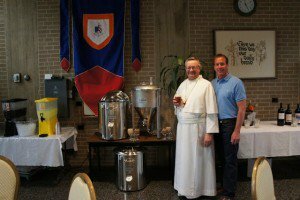 We are brewing beer at a Norbertine abbey in Paoli, Pennsylvania. Daylesford Abbey. 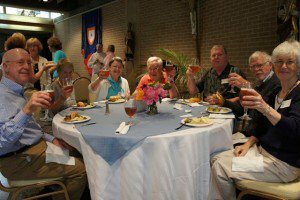 After a discussion about the Abbey, how difficult it is in this economy to support non-profit communities and a random thought, "hey, they should brew beer. You know abbey beer." And so an idea was born. The Daylesford Abbey sits on almost 130 acres of rolling fields and forests and the Norbertines have a tradition over 800 years old of brewing beer in Europe. Abbot Richard Antonucci had just returned from the Prague, Czech Republic abbey when we sat down at lunch and pitched the idea...he immediately got it. From there we wrote a plan, contacted a trusted partner in Northern Brewer, and we were on our way. The abbey has an industrial kitchen that can deliver between 100 and 120 meals at a time. We asked for a small portion of it for 6 hours at time to boil water, mash some grain, use the sinks, etc. They also have a basement which is vast that we ferment in and store beer.